AllegroMedical.com presents The Handheld Shower Head Spray with Diverter Valve. The Handheld Shower Head Spray with Diverter Valve was designed to provide the user with a relaxing experience when showering. Included with the hand held shower spray is a diverter valve which allows the user to switch water flow from the regular shower head to the handheld shower spray with the flick of a switch. 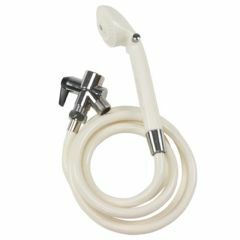 The 80" white reinforced hose is durable and allows for maneuverability increasing control over your bathing experience. When using your traditional shower head the handheld shower spray can be anchored in the holder which is included. An added feature built into the handle is an on / off switch which allows the user a simple way to turn the water flow on or off.